You know which women’s health topic isn’t being talked about enough? The close relationship between diet, gut health, and hormones. I have a major passion for helping women who are struggling from the frustrating side effects of hormone imbalances such as unwanted weight gain or loss, digestive issues, fatigue, hair loss, unwanted hair growth (known as hirsutism), and missing periods by fixing their diet. While many hormone imbalances can be related to food, today we’re covering Polycystic Ovary Syndrome (PCOS) and gut health. How are PCOS and gut health related? Good question! Let’s start by exploring what it means to have a healthy gut. The gut or gut microbiome refers to our entire digestive tract, which is naturally full of bacteria, microbes, and fungi. I understand if you are grossed out but don’t be! Understanding your gut health means understanding your overall health. This teeny-tiny little world known as the gut microbiome helps your body by boosting immunity, aiding in nutrient utilization and metabolism. A healthy gut microbiome also helps strengthen the intestinal walls within the digestive tract and works to prevent harmful bacteria from taking over. The trouble starts once ‘bad’ or harmful bacteria begins to out number the ‘good’ or helpful bacteria in our gut microbiome. The DOGMA Theory (short for Dysbiosis of Gut Microbiota) suggests that an imbalance in our natural gut flora is a root cause of inflammation. This inflammation can lead to an unnatural increase of testosterone and insulin resistance. From a biochemical standpoint, PCOS is characterized as a chronic state of inflammation. 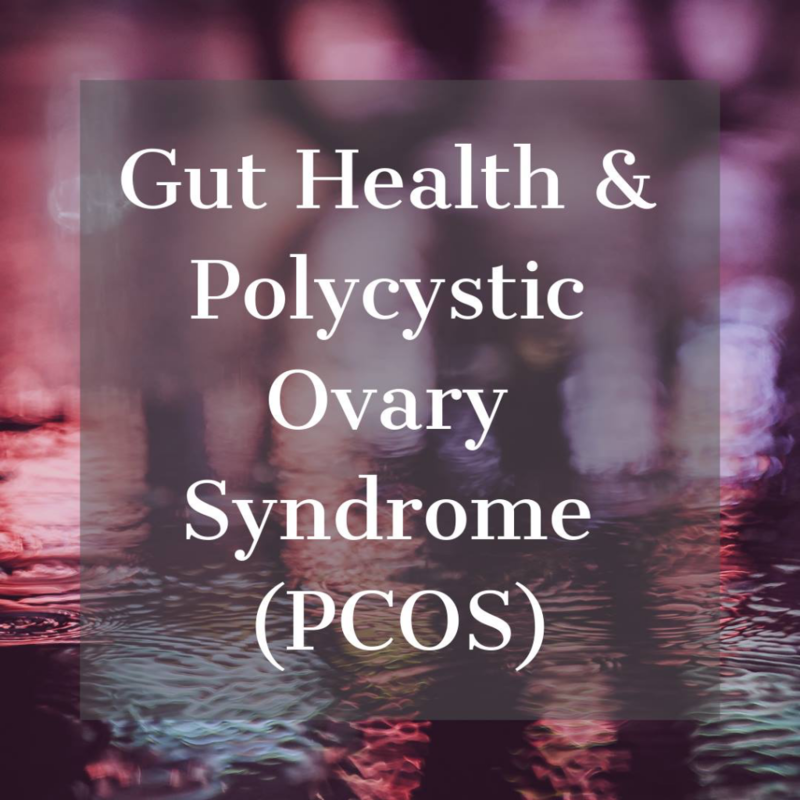 PCOS is often accompanied by elevated testosterone, excess androgens, increased insulin resistance, and greater likelihood of developing type II diabetes. Women with PCOS also have an increased risk of obesity & irritable bowel syndrome (IBS), which are both linked to increased permeability of intestinal lining, commonly referred to as Leaky Gut Syndrome. Sooo that’s a lot of science for ya! The main takeaway point is an unhealthy gut is strongly linked to hormonal imbalances and undesirable symptoms women with PCOS frequently experience. This is why we have to get to the root cause of hormonal imbalances and poor gut health when treating PCOS. One of the root causes being – you guessed it – your diet. Your digestive tract contains tons of different microorganisms and bacteria. A gut with a large variety of healthy bugs and bacteria is a happy, less inflamed gut. To diversify your gut microbiome, eat a wide range of foods with lots of fiber, probiotics, and prebiotics. Whole food sources of fiber include lots of leafy greens (kale, spinach, Swiss Chard), non-starchy vegetables, whole grains, steel-cut oats, berries, and fruit. The term probiotic is defined as a microorganism that maintains or improves beneficial bacteria in the gut when consumed. Prebiotics are like the food for probiotics that help them populate and flourish. Probiotics & prebiotics from food have shown to play an important role in immunity and balancing the microbiota. In fact, research proved rats treated with probiotic strains of Lactobacillus had reduced levels of androgens as well as improved ovarian function. Probiotics in food are commonly referred to as live active cultures. They are found in foods such as fermented vegetables, unsweetened yogurt, Kimchi or Kimchi Probiotic Shots, kefir, kombucha, Farmhouse Culture Gut Shots, and uncooked sauerkraut. While probiotics can be taken in supplement form, certain strains and strain combinations of probiotics help relieve certain symptoms better than others. We are just scratching the surface of the science here. Ask us for a specific probiotic supplement recommendation during your initial consult if you are curious. You can enhance the effectiveness of your probiotics by eating foods high in prebiotics, such as raw onion, garlic, asparagus, Dandelion greens, artichokes, and legumes. Resistant starch also helps feed the good bacteria in our digestive tract and improve insulin resistance. Cook, cool, then reheat potatoes, sweet potatoes, yams, and rice for a good source of resistant starch. Green bananas and plantains are also good sources. Insulin is a hormone released from our pancreas and into our blood when we ingest glucose in the form of carbohydrates. A high carb meal = high intake of glucose = insulin is released. In a healthy individual, this is a good thing because the insulin can move the glucose into our cells for energy. Yay! But when our body is insulin resistant, our cells don’t utilize all of the glucose so it ends up being stored as body fat. Not yay. Simply put, reversing insulin resistance requires eating less simple carbohydrates. Techniques include consuming smaller portion sizes of carbs, eating less frequent meals, and/or intermittent fasting for 12-14 hours. Your first meal of the day should be primarily lean proteins, healthy fats, and fiber in the form of non-starchy vegetables or resistant starch. Try not to snack on foods like crackers, chips, cookies, chocolate, or popcorn (especially without any buffer of protein!) as these will cause high insulin secretion. If you’re craving fruit, pair it with a healthy fat like nuts, peanut butter, or string cheese to slow down the sugar absorption. Makes sense, right? An anti-inflammatory diet is rich in omega-3s, which can be found in fatty fish (wild-caught salmon, tuna, sardines), walnuts, ground flaxseed, and chia seeds. Fiber also promotes gut health and combats inflammation. Blueberries, blackberries, leafy greens, green tea, nuts & seeds, beans & lentils, avocado, olive oil, and fibrous veggies are great for an anti-inflammatory diet. On the flipside, limit foods that are linked to inflammation. Be sure to read food labels and watch for added sugars. High intake of both refined/natural and artificial sugars (such as sucralose & aspartame) can wreak havoc on your intestinal health. Try to avoid the fake stuff completely and save real sugar for special occasions. Processed and packaged foods with a lengthy list of foreign ingredients and inflammatory oils don’t do our gut or waistline any favors. Intead, focus on eating more whole foods. Limit options cooked in vegetable oils such as corn, grapeseed, canola, sunflower, peanut or soybean oil. Olive and avocado oil are better options. Alcohol, especially bottom-shelf brands, can trigger inflammation. Limit your serving sizes to one drink (that’s 5 ounces of wine, 12 oz for beer, or 1.5 ounces of spirits/liquor) on special occasions. Choose wines made with natural ingredients (more on that here) and don’t mix spirits with sugary mixers such as tonic water. Some people have inflammatory responses to foods containing dairy, soy, or gluten. Before you rush to eliminate these foods from your diet, pay attention to how you feel after you eat something that contains one of these components. If you notice any digestive issues such as bloating, cramping, diarrhea, constipation, or general discomfort, eliminate the potential offender (one at a time) for 30 days and pay attention to how you feel. Work with us to help you stay accountable and successful throughout an elimination diet! Inositol (Vitamin B8) studies have shown that supplementing with inositol can be helpful in treating a variety of PCOS symptoms including insulin resistance, high blood sugars, and inflammation. Myo-inositol in particular may also aid in weight loss due to it’s serum testosterone and insulin decreasing effects. Magnesium: Magnesium is one of the most underrated minerals for hormonal health as it plays a crucial role in a variety of metabolic functions including liver detoxification and relieving muscle soreness. Research has also supported than magnesium supplementation can improve insulin sensitivity. Consider supplementing with 300-600 mg of magnesium glycinate before bed and eating magnesium-rich foods such as almonds, spinach, and wild-caught fish. Zinc: Zinc sulfate supplementation has also been shown to have a positive impact on metabolic effects of women with PCOS. Zinc taken in combination with Saw Palmetto has been shown to decrease testosterone levels, which can unwanted PCOS symptoms such as hirsutism or acne. However, the studies on the effect Saw Palmetto has on decreasing androgens isn’t strong enough for me to recommend supplementation at this time. 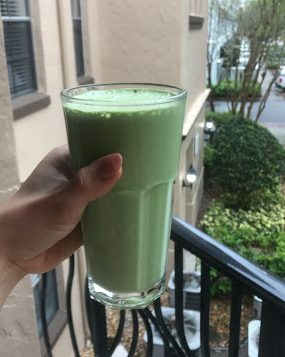 Protein Powders: Eating protein at every meal and snack is crucial to balancing blood sugars for women with PCOS. Protein also help keep us full for longer. Protein powders and bars can be a great option when you’re on the go and don’t have access to actual food. However- not all protein powders and bars are created quality. Be wary of low-quality options with ingredients that may be linked to inflammation such as artificial sugars and flavorings. These disrupt the gut microbiota, which we’ve learned is a major influence of weight and health. Try my favorite natural protein powder, these RD-approved protein bars, or one of these ready-drink-protein shakes. If you know or think you have a dairy intolerance, avoid protein powders or bars with whey and casein. Instead, choose a high-quality vegan protein powder made from rice or pea protein. Here is a list of vegan protein bars. Vitamin B-12: If you are taking metformin as part of your PCOS treatment, consider a vitamin B12 supplement- research and studies consistently prove a strong link between metformin and B12 deficiencies. Don’t stop taking your medication without consulting with your medical doctor. N acetyl-cysteine (NAC): When compared with metformin, NAC has been shown to be an insulin-sensitizing treatment for PCOS. NAC and metformin also show similar effects on improving irregular periods, decreasing Body Mass Index (BMI) and lowering androgens in PCOS population. Women in their reproductive years can benefit from a prenatal vitamin due to the higher concentrations of folic acid, iron, and calcium. Disclaimer: This article is intended for informational purposes only. I am not a medical doctor and recommendations provided should not take the place of medical advice or treatment. Some blog posts may contain one or more affiliate links. I was not paid by any of the companies above to review their products. All opinions are my own.